The last week episode gave us a preview of what this episode would be based on. The encounter between Daigo and Satou clashed as both these characters discuss their intentions.Also, before reviewing this Major 2nd episode 2, if you wish to know more about the characters in general, click this. Satou the son of Toshiya issues that he moved from New York just to Japan due to his family moving. Daigo gets angry when he starts asking about his dad, which is normal. Apparently, all that Satou wanted was to join the local baseball team. As Daigo walks off, Satou asks if Daigo is on that team. The answer was no, due to him quitting baseball one year ago. Daigo is pissed off in general for the very reason that everybody won’t be silent about baseball. When Daigo is walking out of school, a girl comes out and asks him if it would be alright for her to walk with him. He says mid blushing that he wouldn’t mind so. As they have their walk-off home, it gives a small glimpse of potential romance. They both have a small talk. Sakura, the girl that walks with Daigo begins by telling her true opinion about Daigo. While Daigo says that everyone excepted way too much for him, Sakura says otherwise. She listens as Daigo says that him being a son doesn’t make him what he is, but what his father is. Her opinion differs as she says it isn’t true at all, because Daigo has always practiced hard. Sakura has always watched him behind the scenes, not like a stalker, but as a figure to adore. Although Daigo can’t see her true intentions and bashes her away. Even she gets mad, but for the reason that Daigo was her first love, the romance here is strong. Not bad for a starter. Major always had this overwhelming romance pace. Normally it’s rare to see romance in any sports anime, rare, but not impossible. I hope it graduates quickly due to the romance sucker that I am. 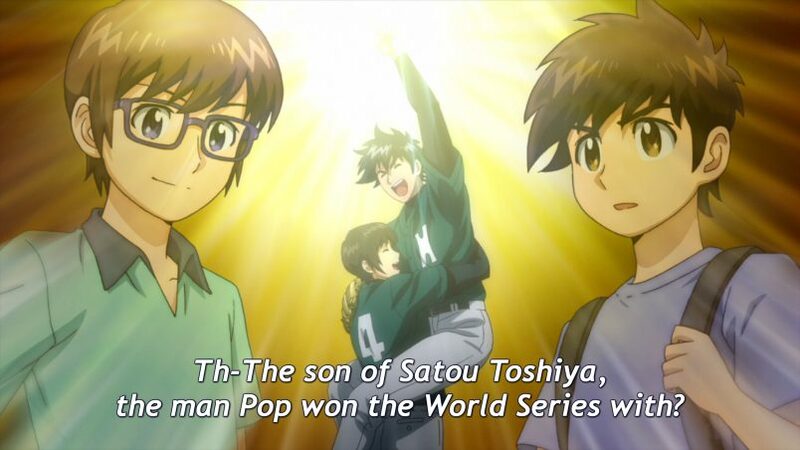 Still, this is a sports anime, reserving such expectations might be the right decision. But I love that about Major. Moving on to the second part of the episode, Daigo still remains with his attitude. It is sorta understandable as to why he does that. All the people that surround him talk only about baseball, the number 1 thing he desires to forget. He himself says that he looked pathetic and caused several bad impressions on the people that had expectations for him. Not only that, but he says that baseball is only a source of pain to him. Just when things were about to get dull paced, Daigo’s mother receives a call. The call was about the fact that there is a need for an extra player in the local baseball team. Now what I found great about this, is that Daigo didn’t even get the option to retaliate. Instead, his own mother confirmed it, that Daigo would be a part of the game tomorrow. This was superb news, Daigo would finally do baseball again. Daigo’s reaction to the news made him fall off from his chair, kinda hilarious. On the next day, Daigo gets dragged out of bed from his mother to the baseball field. Daigo then goes on the bus and just when he was about to enter he sees a familiar face. That being Satou, he is surprised by Daigo being presented, but happy at the same time. As Daigo enters the Baseball field he meets up with his old teammates, some of them give the good greetings. Because his mother is the one that offered that bus. Daigo gets mad once again, for being named only for the favors of others. This gives him a slight edge in terms of characteristics. The game breaks out, at last, Daigo not having played for one year creates a more doubtful atmosphere around my expectations. Luckily he manages to catch the first ball that was thrown. Yet when it comes to throwing the ball, the throw is weak and inconsistent. That’s due to his arms not being as strong, as the coach explains to Satou. Daigo with a more heavy expression on his face. In fact, they are weak. Although, it is witnessed an up remorse when his other teammates failed to do better. In the end, Daigo was doing best than most of them. This was a huge surprised, but once again, as the coach explained, it’s not about him being not up to the task. It’s more due to personal disbelief more than anything. As to why you can see his ease when it came down to playing the game. Not for very long though, as Daigo is called to make a service, and, he fails at every single one. In fact, it was never witnessed by any teammate a single hit from him, and that remains that way. It’s just clear that hitting isn’t forte, while he does have an extraordinary ability in the control department. Daigo’s teammates making an annoying cheer towards him. Not so soon after it, one of his teammates gets his own arm twisted and calls for a substitution. With that said, Satou makes his entrance for the first time. That being his first time and a recent one, because he is a new member, Hence why the coach was insecure about his entrance. I think his smug smile made the viewers relax a little. This anime is just a magic box full of mysteries. What I mean by that is, normally you would expect this character to fully excel in his area. But to your surprise, he manages to be horrible at catching balls. He lacks control, furthermore, it is his very first time playing baseball. For the contrast, he has a monstrous arm strength, everything that Satou desires to have. 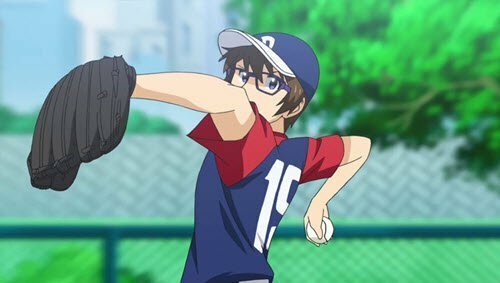 I could see Satou being a thrower due to his immense arm strength. Meanwhile, Daigo could be a pitcher. 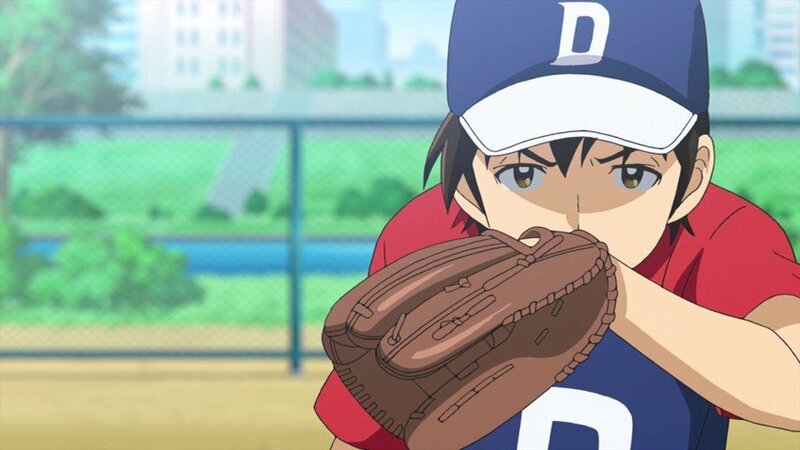 I say this because we don’t know for sure if Daigo is a bad pitcher, just because he never hits the ball. Maybe with Satou’s throws more refined that ambition could be real. An interesting episode for sure. Major 2nd is good so far. A fast developing episode considering the settings that it was given in the previous episode. The music is getting better within every episode. Every moment where the ball is about to be intercepted is meet with an uprising soundtrack. Not only that, but Daigo’s expressions are getting more serious. It reminds me of the protagonist from the Original Major Saga, his father. Like father, like son, eh. Tell me what you think about this Major 2nd episode 2 too. I’m curious to know your opinion in this regard. Haven’t caught up with the first episode yet? 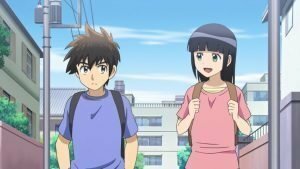 Previous Post« Previous Hinamatsuri episode 1-Arrival of the Psychokinetic Girl!